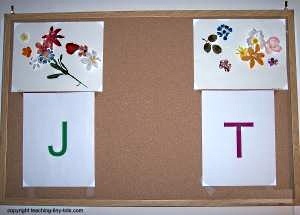 Toddler Activities: Bulletin Boards are a great place to reinforce simple concepts like colors, numbers, letters, and names. 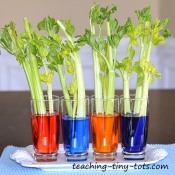 Be sure to showcase those wonderful toddler activities your child has made! A bulletin board is a great visual learning center. 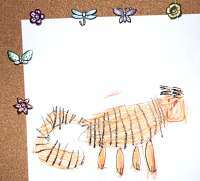 A great way to instill confidence in your child, is to show you are proud of his or her work. It also let's your child know you value "good work" by putting their best efforts on the bulletin board. Decorate with favorite characters...Dora, Thomas the Train etc. If your child is very young, you may decide to decorate it yourself or a very simple theme that will match any room decor. 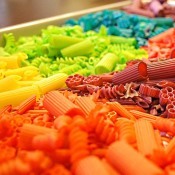 For now the most important decision will be what you choose to display. Put a row of colors, shapes, letters or numbers, pictures of family members or animals to help reinforce recognition and build vocabulary. We used Scotch tape at first to hang items on the board. 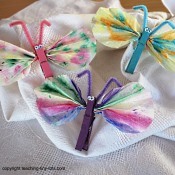 When your child is older cute options for push pins are: vintage tie tacks or pewter push pins with designs. These are pewter pins (see picture) which add a nice touch and are flat. They are a little harder to pull out that regular push pins. There are cute hand crafted ones using regular push pins with small decorations glued to the flat surface but make sure your child will not ingest the pieces if it becomes unglued. Hang in a secure place preferably in a stud in the wall and a little higher than your child can reach but is still visible. Please take precaution in safe and secure placement of board. Position it in view but out of reach of children. Check that you are fastening in a stud and/or using picture holders which hold more weight than just a nail alone. Make sure the cork part of the board is thick enough to hold push pins securely without falling out. This was made by my sister's twins who are 2 years old. 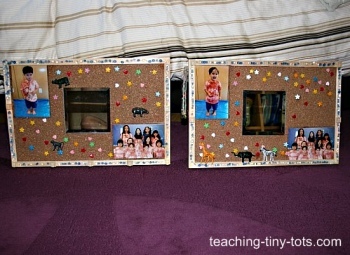 A mirror was glued in the middle and beads used to decorate the edges. 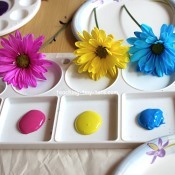 Colorful push pins make this a fun bulletin board to pin up favorite photos or art projects. 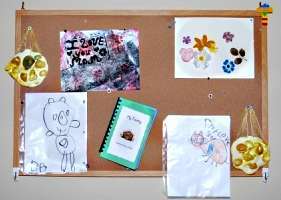 Hang a bulletin board securely in view of the changing table and tape your child's initials to begin the letter and name recognition process. My refrigerator is clutter free!